Two outdoor events are sure to define this month in Islamorada, and will have you taking advantage of gorgeous April weather by spending time outdoors. The first is the annual Florida Keys Island Fest, which returns to Islamorada for its 28th year. On the weekend of April 6 and 7, enjoy a juried art show, live music, great food, classic cars, a homemade boat race, and much more by the beach at Founders Park. On Sunday at noon, witness a mouthwatering culinary competition from top local restaurants during the Taste of Islamorada. Admission is free and on-site parking will be available for a $5 donation. The next event will also take place at our beloved Founders Park. On April 11, enjoy a free screening of “A Plastic Ocean” followed by a panel discussion about how we can keep our Florida Keys waters clean. While the event is free, seating will be limited, so be sure to register in advance. If you're exploring the Florida Keys this month, you may have the opportunity to catch one of the longest running events in the community: the Original Marathon Food Festival. On March 9th and 10th, consider an easy day trip to Marathon Key to experience this 43-year tradition. The festival began in the 1970s as a way for local fisherman to share the fruit of their labor with the community. It is still co-organized by the Organized Fishermen of Florida, a non-profit organization. This family-friendly event features freshly caught local seafood at amazing prices. Menu options include lobster, stone crab, ceviche, mahi-mahi, oysters, shrimp, conch-wurst, lobster bisque, crab cakes, Cuban croquettas, hamburgers, hot dogs, sausages, sweets, and more. You’ll also find local beer, frozen cocktails, live entertainment (rock, country, and island tunes), hundreds of vendors (including nautical products and artisan goods), a boat show, and rides and games for the kids. The event takes place at Marathon Community Park, and more information can be found here. Is life at sea the life for you? Then you’ll want to stock up on supplies at the annual Gigantic Nautical Flea Market at Founders Park in Islamorada. Is life at sea the life for you? Then you’ll want to stock up on supplies at the annual Gigantic Nautical Flea Market at Founders Park in Islamorada. This well-loved local event is hosted by the Upper Keys Rotary Club, and this year it will be held on February 23rd and 24th. Come hungry for the $6 all-you-can-eat pancake breakfast that kicks off each day at 8am. You’ll find bargains on all sorts of goods from boating, fishing, and diving gear, to motors, boats, and anchors. Even if you’re not looking for something truly seaworthy, you can shop for deals on sunglasses and sundresses. There will also be antiques and nautical arts and crafts along with a diverse menu of food options so you can grab a bite while you shop. All proceeds from the $5 entry fee go to scholarships for local youth. If you appreciate the art of bluegrass, your finger-picking dreams can come true on the weekend of January 18-20 at the 7th Annual Baygrass Bluegrass Festival. Islamorada is an ideal place to enjoy music outdoors in the middle of winter, with lows of 63° and highs of 75°during the month of January. If you appreciate the art of bluegrass, your finger-picking dreams can come true on the weekend of January 18-20 at the 7th Annual Baygrass Bluegrass Festival. The festival will begin with satellite events on Friday and Saturday in the Morada Way Arts and Cultural District, culminating with the main event on Sunday at Founders Park, where you’ll find vendors offering handmade arts and crafts, tastings from local craft breweries, and food trucks to satisfy all appetites. This year’s line-up includes The Copper Tones, The Stillhouse Shakers, Belle and the Band, Alligator Alley, and over a dozen more. There are a variety of tickets available, from VIP packages to access to specific parties during the weekend. Proceeds from the 6th Annual Baygrass Bluegrass Festival go to help fund Arts and Music Scholarships for Upper Keys Youths as well as Islamorada Community Entertainment. Islamorada is the perfect place to escape winter, but you don’t have to forgo the holiday spirit while visiting the tropics. It just so happens that two of Islamorada’s most delightful holiday events will take place at Founders Park. The first is the 14th annual Islamorada Chamber of Commerce Holiday Fest, which will take place from 4-10pm on December 7th. This family-friendly event includes a 35-foot tall holiday tree; a Holiday Gift Bazaar; delectable treats and hot drinks at Santa's Sweet Shoppe; a silent auction of handcrafted ornaments; the annual Holiday Parade; and the 30 tons of snow that comprise the phenomenon that is Snow Mountain. The following weekend, sweet sounds will infuse the tropical air for “Holiday Suite Treats” at the ICE Amphitheater in Founders Park. Catch a concert from the Keys Community Concert Band, as well as story-time, sing-alongs, a children’s ballet troupe, handbell ringers, and Santa himself. When you’re surrounded by lush tropical scenery and gorgeous blue waves, it's easy to work up an appetite--after all, vacations are for indulging. Fortunately, we know precisely how to enhance your trip. Nestled just steps from the beach under the cool shade of swaying palm trees, taste the ocean at Wild & Lime --our on property gathering spot for light bites and refreshing drinks. When you’re surrounded by lush tropical scenery and gorgeous blue waves, it's easy to work up an appetite--after all, vacations are for indulging. Fortunately, we know precisely how to enhance your trip. Nestled just steps from the beach under the cool shade of swaying palm trees, taste the ocean at Wild & Lime --our on property gathering spot for light bites and refreshing drinks. Indulge in savory fish tacos, fresh conch ceviche, or crisp old bay shrimp to experience Florida Keys cuisine at its finest. It’s the perfect menu to compliment a fun day in the sun. We even have a special menu for your “little minnows,” including hot dogs, pizzas, burgers and more. Treat your crew to a thoughtful and effortless meal then lounge poolside feeling satisfied. What do zombies and the Florida Keys locals have in common? We all have a thirst for local beers! Join the 4th annual Islamorada Zombie Pub Crawl on October 20th for an evening full of fun socializing, riding, and of course, drinking. What do zombies and the Florida Keys locals have in common? We all have a thirst for local beers! Join the 4th annual Islamorada Zombie Pub Crawl on October 20th for an evening full of fun socializing, riding, and of course, drinking. Dress in your best zombie garb for a tour of three pubs, beginning with Moose Lodge at 5:30 pm. Hit up the jukebox at Whistlestop before heading to the Florida Keys Brewing Company, one of our favorite Upper Keys microbreweries. Try out their seasonal lineup of craft beers, including the "Great Pumpkin Demise" to get into the fall spirit. Fortunately, they’ve been warned, and are zombie friendly. The best group, individual, and couple costumes will be judged at Whistle Stop, with the winner announcement at the Florida Key Brewing Company. Bike rentals are available from Backcountry Cowboy for $20 and will be ready for pick up at Moose Lodge. Now that’s what we call convenience. Plan your Islamorada escape to coincide with this fun and festive occasion! What Makes Florida Keys Sunsets Incredible? The Florida Keys are known for a myriad of reasons—gorgeous weather, tropical coral reefs, and world-class fishing to name a few. However, when visiting our stunning archipelago, there is one thing you can’t miss, which are the panoramic sunsets that sprawl out like vivid rainbows across the sky. Imagine sitting on the beach, palm trees swaying, ice-cold drink in your hand, and the most vibrant display of purples, oranges, and pinks overhead as the sun approaches the horizon. The Florida Keys are known for a myriad of reasons—gorgeous weather, tropical coral reefs, and world-class fishing to name a few. However, when visiting our stunning archipelago, there is one thing you can’t miss, which are the panoramic sunsets that sprawl out like vivid rainbows across the sky. Imagine sitting on the beach, palm trees swaying, ice-cold drink in your hand, and the most vibrant display of purples, oranges, and pinks overhead as the sun approaches the horizon. Weather expert Bill Cottrill explains the scientific reason behind such magnificent skies—it’s our stellar combination of clouds that create these world-famous sunsets. Low cumulus clouds scattered along the horizon make pockets of colorful shadows and high cirrus clouds made primarily of ice reflect the sun’s rays, resulting in something magical. Pick a prime spot, gather your friends and family, and let mother nature’s display dazzle you. Here at La Siesta Resort, we like to do thing bigger and better. Well, that’s not entirely true. We actually love the laid-back Islamorada way of life. However, when it comes to leisurely activities, we go big. That’s why we provide tons of attention-grabbing games that are designed to help you relax. Here at La Siesta Resort, we like to do thing bigger and better. Well, that’s not entirely true. We actually love the laid-back Islamorada way of life. However, when it comes to leisurely activities, we go big. That’s why we provide tons of attention-grabbing games that are designed to help you relax. Take a break from our luxe pool or sandy beaches to spend the afternoon playing a game of life-size chess or checkers. The bright Florida sun and the swaying palms trees a perfect picturesque backdrop for the big competition. Challenge your friends and family to an intellectual meeting of the minds, while expertly maneuvering your massive pieces around the board. Games are a fabulous way to connect with your loved ones while having a great time. Immerse yourself in the casual elegance of La Siesta Resort, while snapping Instagram-worthy shots with your new friends, the over-sized knight and bishop. Want to know how to make the most of your Fourth of July? Let us pique your interest. Islamorada becomes a playground for patriotism during Independence Day season. Want to know how to make the most of your Fourth of July? Let us pique your interest. Islamorada becomes a playground for patriotism during Independence Day season. This year join the folks of Paddle! for a free paddle boarding session--bring donations to benefit the local food bank. Later on, get down with the festive locals and excited tourist at Founders Park for the annual “Spirit of Islamorada” Fourth of July party. It kicks off at 6:00 pm with a yummy baked apple pie eating contents and rocks until 9:30 pm when the fireworks begin. Enjoy live entertainment from The Carousers and Leah Stutter while selecting dishes from food vendors like Chef Drew’s Island Catering, Craig’s Restaurant, and Il Pizzarello. End the night with a dazzling firework display that will impress even the most discerning firework enthusiast. Happy Independence Day y'all! The warm summer waters of the Florida Keys are waiting for exploration. Elevate your vacation by spending a day underwater. We’ve rounded up our top three favorites snorkeling spots all within an hour of La Siesta Resort & Marina. Nestled below a historic lighthouse is one of the most vibrant and colorful snorkeling spots in the Middle Keys. Located just four nautical miles from Indian Creek thousands of fish and sea creatures congregate below the shade such as stunning yellowtail snapper, spotted parrotfish, and blue tangs. Marvel at the sea turtles, beautiful corals, and tropical fish of Cheeca Rocks Sanctuary Preservation, dedicated to protecting inshore patch reefs. Witness the Christ of the Abyss, an eight and a half foot 4000-pound bronze sculpture of Jesus Christ just 25 feet below the surface. Over 250 species of exotic fish live in this brilliant coral reef. Here in the Florida Keys, we like to keep things laid-back and local, which includes our craft breweries. Spend a lazy afternoon getting into "An Island State of Mind" at one of our favorites spots, Islamorada Beer Company. Here in the Florida Keys, we like to keep things laid-back and local, which includes our craft breweries. Spend a lazy afternoon getting into "An Island State of Mind" at one of our favorites spots, Islamorada Beer Company. Sample a flight of seasonally rotating beers or dive right in. Brews such as the Sandbar Sunday and Islamorada Ale both have a crisp, citrusy flavor that pairs perfectly with summertime activities. The brewery has been open since 2014 and is quickly becoming a tourist destination of its own. Ask for a tour and explore the 25,000-square-foot brewery that smells of hops and barley. Quench your thirst by picking up a 6-pack or snag a commemorative pint glass to bring a piece of the Florida Keys back home. It’s Relaxing - The beach is scientifically proven to relax the body. Just being near to the ocean activates the parasympathetic nervous system, which is responsible for all of those laid-back feels. So get cozy and let the lapping ocean waves do their job. Increases Activity - Whether it’s a casual stroll on the beach or an active day of water sports and adventures--being beachside activates your body. Replenish Your Vitamin D - The majority of Americans are Vitamin D deficient, spending time under the brilliant sun is just what the doctor ordered. Make sure to use adequate sunscreen, but let those stunning rays give you a healthy dose of sunshine and Vitamin D.
These are just three reasons to get on the ball and book your trip. We look forward to seeing you soon. For reservations, click here. We have great news--our doors are open and we can’t wait to welcome you back! After month of recovery and improvements, we are back and better than ever. So pack your bags and head to our stretch of paradise in the Florida Keys. We have great news--our doors are open and we can’t wait to welcome you back! After month of recovery and improvements, we are back and better than ever. So pack your bags and head to our stretch of paradise in the Florida Keys. Get excited for Spring activities such as snorkeling, scuba diving, paddle-boarding, kayaking, and extreme sports fishing. Whether you are craving a relaxed vacation under the tropical skies or want to get your feet wet with some high-energy water sports, we've got you covered. After all, we are the Sport Fishing Capital of the world and anglers from all over the globe come to sample our thriving fish-filled waters. Feel like tasting the ocean without the hassle? Indulge in some scrumptious fish tacos from our onsite eatery, Wild & Lime --where light lunches and snacks are transformed into memorable meals shared under the swaying palms. So alert your crew, La Siesta is open and we look forward to seeing you soon! Treat your beloved to a relaxing vacation in the Florida Keys--from water sports to romantic activities, reconnecting has never been easier. Treat your beloved to a relaxing vacation in the Florida Keys--from water sports to romantic activities, reconnecting has never been easier. Here’s three ways to spark the flame in Islamorada. Leave Your Worries Behind: Nothing says couples bonding like walking hand-in-hand along the shoreline. Our breathtaking sunsets will leave you in awe. Get Dirty: Spark your chemistry and let the endorphins fly by tapping into your sporty-selves and renting bikes or going for a mid-afternoon kayaking trip through the turquoise waters. Seeing your better half sweating in the Florida sun is just the ticket to attraction and connection. You don’t need an excuse to celebrate love, fan the flame all year long with these romantic adventures and excursions. The holidays have passed, which only means one thing: it’s time to start thinking about your next vacation! Going on a trip doesn’t mean ditching your new year’s resolutions. Spend your free time with us and we’ll show you how to make this year the best yet. Exercise: Take a stroll on the beach or grab a hat and take advantage of our complimentary kayaks, bicycles, paddleboards, and more. Nothing gets your heart pumping like water sports on a sunny day. Eat Healthy: Dive into a Mahi Mahi Taco or dip into a bowl of Conch Ceviche--fresh Florida Keys fish is the ultimate way to start the year off right, while leaving the extra calories behind. Wild Lime, our poolside bungalow, is now open and ready for visitors. Laugh More: Leave your smart phone tucked in your beach bag and connect with the people around you. Laughing is good for your mental and physical health, plus it tightens those abs! La Siesta Resort & Marina is the ultimate place to relax, unwind, and head into 2018 with a smile and renewed sense of wellbeing. This winter head south to Islamorada in the Florida Keys. Ditch the snow boots and puffy coats and slip into something a little more comfortable. From friendly locals to coastal vistas, we make escaping easy. Here’s the top three reasons to melt away the winter blues with us. Picture-perfect 74 degree days and 62 degree nights set the scene for daytime adventures and moonlit evenings under the stars. While the rest of the country shivers, we bask in the crisp sunlight and celebrate everyday like it’s summer. From paddle boarding through the mangroves to kayaking along our coast, the shoreline is the limit when it comes to outdoor sports. Snorkel amongst schools of tropical fish or go deep for a dive amongst our coral reefs. Whatever you desire, the Florida Keys provides. Pop over to Robbie’s Marina to feed the 200lb Tarpon and get a taste of quirky local culture. It’s fun for the whole family and the number one tourist destination. For more info click here. Need more reasons? Book your next tropical vacation right here. Have you ever been curious about the Florida Keys? Read on for cool and interesting facts about our beautiful archipelago located between the Atlantic Ocean and the Gulf of Mexico. There are a whopping 800 keys. A “key” is a small low-elevation island above a coral reef. The Florida Keys are comprised of 800 of these island, some bigger than others. The longest key is Key Largo. Located just north of Islamorada is Key Largo, stretching over 30 miles long and 0.5 miles wide. Tequesta and Calusa Native Americans were the first inhabitants. Prior to the Europeans, these two tribes lived amongst the islands. Islamorada is a Spanish name. Take in one spectacular sunset over the Florida Bay and you’ll understand why Spanish explorers named this slice of paradise “Islamorada,” which translates to “purple island” for it's deep "morada" hues. Robbie’s Marina has the largest tarpon. A trip to Islamorada is not complete without visiting Robbie’s, the finest place to feed massive tarpon and enjoy a cool draft beer. Now that we have peaked your interest, consider a stay at La Siesta to discover some fun facts of your own. We are pleased to announce that our foliage and flowers are in full bloom and that the sun is shinning brighter than ever. Our team of clean-up crews, staff, and resort associates are in great spirits because of the warm outpour of support and thoughtful messages. This September, Hurricane Irma swept through the entire peninsula of Florida and although La Siesta Resort & Marina suffered some hardships, we are resilient and working around the clock to rebuild and welcome guests back to our Islamorada hideaway. We are pleased to announce that our foliage and flowers are in full bloom and that the sun is shinning brighter than ever. Our team of clean-up crews, staff and resort associates are in great spirits thanks to the warm outpour of support and thoughtful messages. We intend to reopen our doors and be better than ever, so expect nothing short of pure relaxation the next time you visit us in paradise. Thank you for your continued support and thoughts. Together we are #IslamoradaStrong and look forward to welcoming you back to La Siesta Resort & Marina soon. Follow our progress on Instagram and Facebook. Islamorada is known as the “sports fishing capital of the world,” however that doesn’t mean we don’t have exploring-worthy spots on land. Make the most of your vacation and check out these popular tourist destinations. If the idea of swimming with dolphins and snorkeling sounds like your ideal summer day, head over to one of Florida’s oldest marine mammal parks. Don’t feel like getting wet? Visit the adorable rescue sea turtles or catch the witty and entertaining sea lion show. Fun for the whole family! Explore fossils that date back to nearly 125,000 years ago. You are literally walking through a fossilized coral reef that was previously a quarry for the Florida East Coast Railroad. Truly one-of-a kind and sure to fascinate you. It’s one of Florida’s natural wonders that's ideal for inquisitive minds. Time to burn off that delicious tropical cocktail you just had by our luxurious pool. Vacations are a time of rest and relaxation, but that doesn’t mean you can’t burn some calories at the same time. Here’s a few expert tips on how to stay fit while staying at La Siesta Resort & Marina. The early bird gets the worm! Pick from either a dip in the pool or a refreshing swim in the ocean. It’s the ideal way to wake up your senses and stimulate that blood flow. Water sports are the best way to get that vacation glow. Explore the surrounding waters and let the good times roll while shedding those extra pounds. Bicycles are available to rent through the front desk. Take a low key ride or put a little pep in your step and watch the palm trees swaying in your dust. Incorporate these activities into your holiday routine and return home with a summer smile from the inside out. Nestled on the coast of Islamorada is a tropical paradise awaiting your wedding -- and here are the top reasons you should have your destination wedding with us. Exotic beachfront setting means a ceremony to remember. Serene beaches, waves crashing, and palm trees swaying is the ideal ambiance to commit to each other. The experience will inspire everlasting memories with stories amongst families and friends to last a lifetime. Destination weddings are smaller and more intimate, allowing time to truly connect. It’s your momentous day, but that doesn’t mean it’s needs to cost a fortune. The quiet charm and natural beauty of the Florida Keys doesn’t require much to be magical and festive. Our hotel offers a variety of packages and options to fit your budget without compromising the luxury and class you deserve. Romance is just a decision away. Enjoy the privileges of our stunning resort and treat yourself to memories for a lifetime. For a full list of options, click here. There’s no wrong way to enjoy a lobster, but when you have meat this juicy, we suggest having it sautéed in white wine butter, shallots, and scallions. Distinguished by the spines along it’s body, they are smaller than their Maine counterparts, but just as succulent and memorable. No trip to the Keys is complete without these wild-caught, sweet, plump, and incredibly fresh shrimp. They are ocean-to-table and usually served “peel and eat’, which compliments Islamorada’s low key vibe. Get ready for a flavor explosion. The most famous pie in South Florida and the quintessential flavor of vacation. Created in the 1800’s by “Aunt Sally” the cook of Bahamian-immigrant William Curry. Made from the freshest key limes, a tart and savory treat, that has people coming back to the Keys for more. Look for these local dishes and ingredients on menus and taste all that we have to offer. Spring is heating up in the Florida Keys, celebrate the season and Easter with this innovative and festive activities. Join Islamorada Village of Islands Parks & Recreation for this family fun Egg Hunt. Hop over early for the arrival of the Spring Bunny and don’t forget to bring your camera. At 10:30am age appropriate groups will begin the egg hunt, and each age group will have a Golden Egg with a special prize awarded. Celebrate Easter in a true Florida Keys manner, this is by far the quintessential egg hunt. Each year an elusive bunny dives into the reef and hides real eggs that have been dyed with nontoxic colors for reef safety. The event is hosted by Captain Slate’s Scuba Adventures in Tavernier and kids enjoy the event by snorkeling while adults can scuba to the fun. The Islamorada Seafood Festival & Art Show is the perfect place to taste the Florida Keys. We can’t think of a better activity than hanging out by the ocean and eating seafood. Get ready for a flavorful explosion from over 20 of the best restaurants in Islamorada. The Islamorada Seafood Festival & Art Show is the perfect place to taste the Florida Keys. We can’t think of a better activity than hanging out by the ocean and eating seafood. Get ready for a flavorful explosion from over 20 of the best restaurants in Islamorada. Try affordable samples and locally crafted libations, while socializing and taking in the views. However, it’s not just for adults, it’s also family-friendly. Come on by to see local artists, belly dancing, live music, Junkanoo parades and more. Never heard of a Junkanoo parade? They are originally from the Bahamas and feature colorful costumes and floats. We can’t wait to see what this festival has lined up. Head over to the Moose Lodge on March, 19th, from 11am -5pm, to join the nautical celebration. Proceeds from the event benefit Moose charities. Looking to rekindle your romance and fall in love all over again? We can’t think of a better place than the Florida Keys. Enjoy each others company while experiencing these beach vacation activities: Wake up early and take a morning stroll along our oceanfront oasis hand-in-hand. Listen to the sounds of the palm trees and the ocean waves rolling in while you plan the days adventures. Explore the magic of the Atlantic Ocean while kayaking with your beloved. The perfect activity for adventure and bonding. Pick up a complimentary kayak at Sea Monkey, located 1 mile away at our sister location, Amara Cay. For more information visit: http://seamonkeydivers.com Then, indulge in a couple’s picnic under the moonlight. Nothing says romance like candlelight, a beach blanket, and a meal for two. With the lack of city light, the sky will sparkle and provide the most seductive background for these timeless moments. 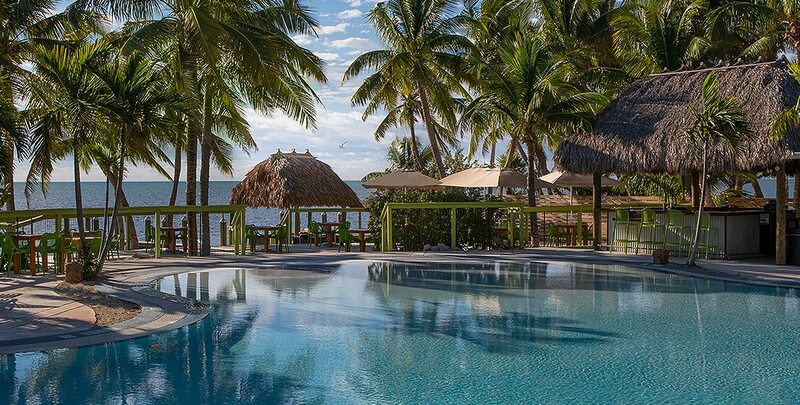 Lucky you, you’ve escaped the cold and you are in Islamorada during the best month of the year. Indulge in Uncorked, the Key Largo Food and Wine Festival starting on January 5th and running until the 14th. Lucky you, you’ve escaped the cold and you are in Islamorada during the best month of the year. Indulge in Uncorked, the Key Largo Food and Wine Festival starting on January 5th and running until the 14th. Local restaurants and spirits shops join forces to bring you eleven action filled days of delicious foods, drinks, music, culinary classes, wine pairings and more. It is the best wine and food festival in the Keys. If your idea of a great time is trying all of the delicacies we have to offer, you have come to the right place. A couple of stand out events are the Paella and Sangria night at Martinis from 6-8pm on January 6th where Chef Drew’s infamous Paella is perfectly paired with endless Sangria and fine wines from Spain. The event costs $10 dollars and is all inclusive. If you are craving sushi, head to Kaiyo, on January 10th, for a sushi and sake tasting that will have you mouth in heaven. The list goes on! We suggest checking out the full list of events here: www.floridakeysuncorked.com.